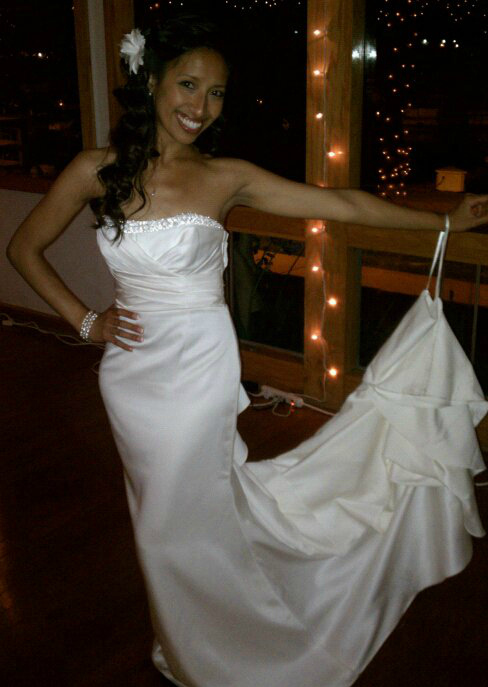 True story: The bustle of my wedding dress broke soon after the reception started. What's a bride to do? Wear the ribbon used to hang the dress up around her wrist, of course! Genius move, in my opinion. It's a good thing I didn't spend much on my dress, because I partied hard, and that dress went to Hell in a handbasket! First the broken bustle and then... well, let me explain. In light of my wedding anniversary on Tuesday, I thought I'd show you my most epic bride fail. 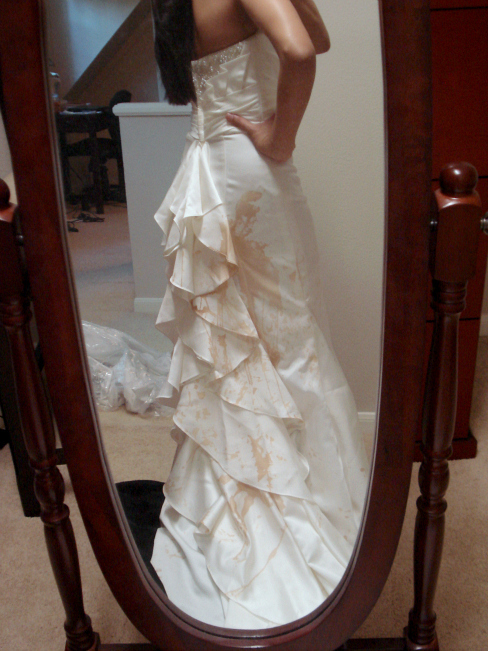 Last year I mentioned that "a margarita was spilled on my wedding dress, and I was too happy to care." 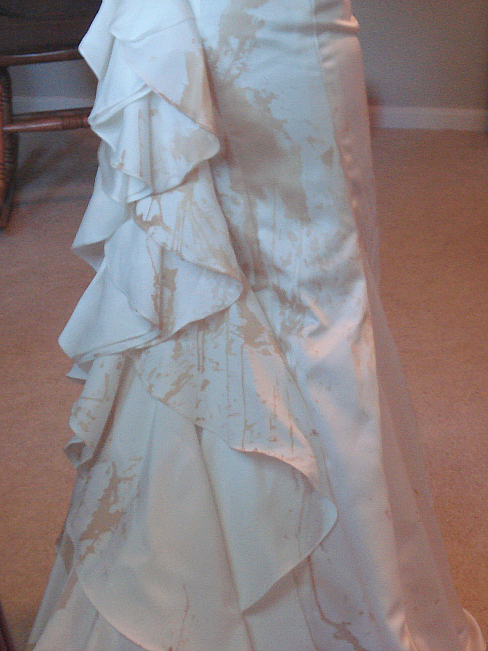 Apparently, I was too happy to remember that I should get the dress cleaned and preserved too. We packed up our home and moved to another state three weeks later, so I'll blame the memory lapse on moving. I was laughing hysterically when I put it on! It was a beautiful dress, but it didn't mean so much to me that I'd cry. I am disappointed that I can't sell it or donate it (which I had planned to do originally). Even if I take it to the cleaners, I doubt they'll be able to get the stains out after two years. It ain't pretty, my friends. It's too bad we didn't have a Trash the Dress photo session. Future brides, avoid this major bride fail. Get your wedding dress cleaned right after your wedding. Oh my!! I turned my dress into a throw pillow because I wanted to look at it everyday. You could totally do that if you were interested. My dress hasn't been cleaned... and it's been eight years! I should clean it, though, and donate it, since I have no intentions of ever doing anything else with it. It's too bad getting a wedding dress cleaned is so expensive, since it'd be worth a shot to see if the margarita came out otherwise! Ummmm.... my dress hasn't been cleaned or preserved. I have no idea what kind of shape it's in. At least the margarita stain makes for a good story! I think every wedding dress bustle breaks. It has at every wedding I've ever been to. Those dress makers need to reinforce their bustles better! This is AWESOME! I probably only think this is awesome because it wasnt my dress and I know you were too happy to care! I am way to sentimental! You should do a fun trash the dress session now!! You look radiant in it, btw! Keep it for Halloween, wait until a rain storm, go roll around in the mud, gather 10-15 of your awesome friends and do a Thriller flashmob!! What a beautiful mark of a fun time! We moved to TX a week after getting married too, and as far as I know my dress is in a closet in VA.....still uncleaned. Oh I need to get it cleaned and preserved! PS my bustle broke too and I dragged the dress around all evening! haha oh no! can you dye it a new darker color? and then wear it again for something else fabulous! my grandmother spilled champagne on her wedding dress all down the front of the skirt and didn't get it cleaned, so when my mother went to wear it... well, they had to take a whole panel out of the skirt! it ended up working out perfectly though because Nana, a '50s bride, had tons o' petticoats. Mom, married in '79, wanted the skirt to just fall - so they didn't need the extra fabric anyway! NOTED! My dress is soooo dirty at the bottom, and right when I went to sit down at the reception, Sebastian stepped on it, and ripped where the bustle was buttoned up... so it just dragged a bit more on the floor.. which only caused more people to step on it and rip it even more... hahaha! Haha, i actually think the "fail" title doesn't go to you, but the person who spilled the margo.. that's bad! :) at least it's a good story! Good for you for making it work! You could always turn the bodice into a keepsake pillow or something - I am sure a seamstress could make the clean parts into something amazing! My bustle broke too! Half way through the first dance. First off, happy almost anniversary. I love your sense of humor and your ability to not let this bother you in the slightest. I love it, now the dress gives you even more stories to tell. Oh my goodness! I love that you were too happy not to care about that :) You could totally still do a trash the dress session! I totally had the same thing happen! Except mine is champagne from the toast. Ben bumped me while I was taking a sip and it when down the front of my dress. And I think my mom had it cleaned after, but they didn't spot check/clean it. So it's permanently there. Oh well. I don't plan on even needing to wear it again! "I'm Going to Live Here Forever." Sometimes, Other People Say It Best.